The Argentine Stem Weevil (ASW) is one of the most difficult insect pests to control in cool season turf. Part of the reason is that in the past, detailed knowledge of the pest’s life-cycle has not been readily available in Australia. This has made it difficult to plan a genuine control program based on established biological information. Syngenta now has solid data on the ASW, generated over the last 10 years from various development programs. This enables us to better understand how many generations of weevils per year are 'normal' or 'typical'; what the generation intervals look like; how these intervals change from the beginning to the end of each season, and what happens when consecutive generations go uncontrolled. Adult stem weevils seem to only ‘overwinter’ – that is, remain in the thatch in sheltered areas – in the colder parts of Australia. In the warmer parts of Australia such as coastal NSW, adults may remain active throughout the winter. Although adults may remain active throughout the winter, they are unlikely to lay eggs between the months of March and July. Egg-laying periods depend on climatic conditions. In the warmer parts of Australia such as NSW, the first stem weevil eggs are more likely to be laid in July. In cooler parts such as Melbourne, it may be as late as early September. The lifecycle of the ASW is dependent on the temperature – it can be completed in as little as four weeks during the hotter parts of summer. Intervals between generations shorten as temperatures rise from early spring to mid/late summer. Four generations per year appears normal, with more generations possible in warmer climates. Overlapping lifecycles also appears to be a normal occurrence, which means active grubs can exist alongside adults. Eggs are laid in the top layer of the sheath; young instars feed down the tiller towards the crown; older instars live in the thatch and feed on roots. This means proactive and reactive control programs may need chemistries that are applied and placed differently, or different chemistries altogether. A control program that matches the stem weevil’s biology is ideal to optimise control and minimise the total number of applications needed. So, what is current best practice when it comes to effective ASW control? Here are four things to keep in mind. The key to preventing stem weevil problems is to control the first generation by employing a two-pronged approach: attack the grubs and the adults that produce them. If the first generation (i.e. the grubs) is not controlled, numbers build up in subsequent generations, causing significant damage. Get it right, however, and pest pressure can be greatly reduced. It’s worth noting that weevil damage is often not visible until the grass becomes water-stressed when the temperature heats up in late spring/summer. At this late stage, control becomes very difficult, as pest numbers are high and multiple life stages are present. Even if you achieve 90 per cent control, 10 per cent of pests is still a significant number that can continue to cause damage. It's a numbers game – turf managers need to use all the tools available to keep ASW populations below threshold levels. In ideal circumstances, adult weevils emerge over a relatively short period of time, which results in a narrow period of intense egg laying. When this occurs – and if good monitoring is in place to detect their arrival – one or two insecticide applications can successfully maintain ASW populations below damaging levels over summer. Spring weather, though, is notoriously variable both in temperature and rainfall. This unpredictability greatly impacts the behaviour of overwintered weevil adults, resulting in wide extremes in the intensity and duration of egg-laying and subsequent larval development. This makes ASW management difficult because adult activity can be hard to decipher. Instead of a narrow peak of egg-laying, there may be a prolonged period when eggs are deposited and larvae damage the turf. The need for multiple insecticide applications often goes unnoticed until the grass begins to quickly fade during the first hot or dry spell in November. ASW management is further complicated by the fact that differing microclimates on an individual course can result in up to a 10-day difference in weevil development. For example, an open green with a northern exposure will experience earlier egg-hatching than a nearby green that has a southern exposure and is lined with trees. Both locations will require different timings for insecticide application. Based on all the information now available, it is clear that the best control programs include both adulticides (such as synthetic pyrethroids or chlorpyriphos) and larvicides (such as SPINNER and/or fipronil). 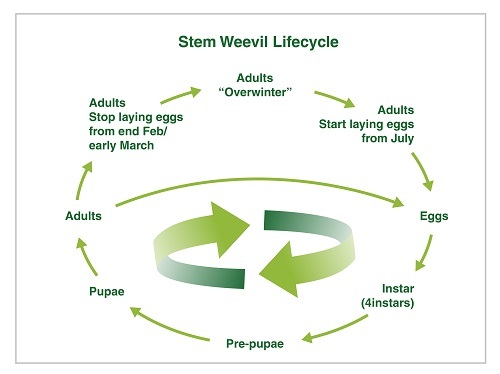 An adulticide application early in the season, with additional targeted applications when weevil numbers appear, should reduce the number of adults laying eggs. The exact timing of the first application depends on your local environmental conditions, as this will influence when the adults first appear. In the south, this may not be until August/September, but in coastal areas of NSW, stem weevil adults are regularly seen on greens during winter. From July onwards, it’s a good idea to monitor your turf for the appearance of adult stem weevils – spray greens and surrounding areas to prevent migration into the critical green and collar areas. But don’t put all your eggs in one basket. Adulticides are only effective for up to two weeks, and may not kill all the adults. With each female laying up to 300 eggs over several weeks, it does not take many surviving adults to generate a large number of damage-inducing larvae. This makes it crucial to protect your turf from the larval stage by applying a systemic larvicide. A product like SPINNER protects turf from the larval stages of weevils for several weeks or longer, and also effectively targets the young larval instars feeding in the stem. As with many insects, these first instars are an ideal target to break the lifecycle: they are more susceptible to insecticides than the later instars and adults. It’s worth noting that if unchecked, the first generation may reach more than 500 larvae per square meter of turf grass. Under such high population pressure, even programs that provide exceptionally high levels of control will allow individual weevils to survive and produce subsequent generations throughout the summer. By the middle of November, ASW populations have usually become asynchronous – meaning that all life stages are present at the same time. To maintain control, a combination of adulticide and larvicide is required to keep the stem weevil population below threshold level. Like disease management, a weevil control program needs to have an active monitoring program and chemical rotation. With four or more generations of ASW developing each year, this pest is an ideal candidate to develop resistance if poor insecticide management practices are followed. In the US, resistance to pyrethroids has been documented, with populations showing enhanced metabolism in several enzyme systems. This gives rise to the possibility that they could show increased levels of resistance to other classes of insecticide with different modes of action. Although resistance has not been proven in Australia, there remains no room for complacency in ASW control. An effective program is a ‘must have’ for any turf manager.